Monmouth county NJ has many reception sites and banquet facilities to choose from to help you plan your wedding – especially for a Jersey Shore Wedding! Monmouth County catering halls make for an excellent location for your wedding. Be sure to book your Monmouth County wedding venue in advance to ensure you can reserve your date. Bella Vista Country Club is one of the premier venues for weddings, showers, civil unions and events in Monmouth County. Our sprawling golf course sets the stage for a memorable event from our wedding pavilion to our tastefully designed clubhouse. Begin your wedding with a cocktail hour in our waterfront Regency Room, a glass atrium. Then continue with a gorgeous reception, of up to 250 guests, in our Terrace Room featuring large windows on three sides overlooking the water and evening sunsets. The Colts Neck Inn specializes in hosting your next special occasion. We offer a full-range of private rooms and a banquet hall that is suitable for any need or size. Come view our newly renovated Grand Ballroom & Outdoor Garden Patio for your next special event. Glamorous venue for your wedding reception. With gorgeous crystal chandeliers, indoor and outdoor ceremony areas, gourmet catering, and an expert team of event coordinators, it’s easy to see why the Crystal Ballroom is a Monmouth County favorite. Lodge-inspired haven providing a perfect mix of luxury and laid-back mission style ambiance. Surrounded by rich woods, and soaring windows warmed by accents of fireplaces, glowing lamps, and earth-toned accessories, your guests will enjoy the experience along with delicious cuisine. The Casablanca Ballroom, located on the second floor of Raven & the Peach, has been decorated in the richest woods and finest fabrics dressed with luxurious table appointments held underneath a skylit ceiling and surrounding windows affording a desirable view of Fair Haven. Upon entering the historic beauty and grandeur of the Shadowbrook mansion you are greeted by the elegance of old world charm. Our lush estate provides an exquisite setting for the most private gathering to grand scale celebration in all seasons with outstanding service and world-class cuisine. 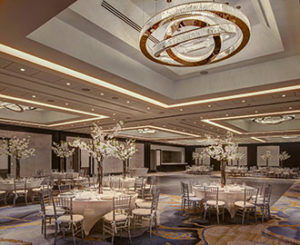 The newly renovated Grand and Regal Ballrooms can host up to 350 guests with a large dance floor, and feature spectacular infinity chandeliers, starlit atriums, rich natural textures and shimmering metallics. Wedding room blocks are also available across our 208 renovated guest rooms and suites. A beautiful Victorian mansion located in the tranquil Jersey Shore community of Spring Lake hosting picture perfect weddings with an elegant ballroom, private cocktail room, bridal suite and outdoor courtyard. With one wedding at a time, you will have exclusive access to all we have to offer. From the chic, simplistic elegance of the Doubletree hotel and Sterling Ballroom lobby, to the understated glamour of the ballroom, you’ll find the same high-level of taste in every detail of your wedding day.